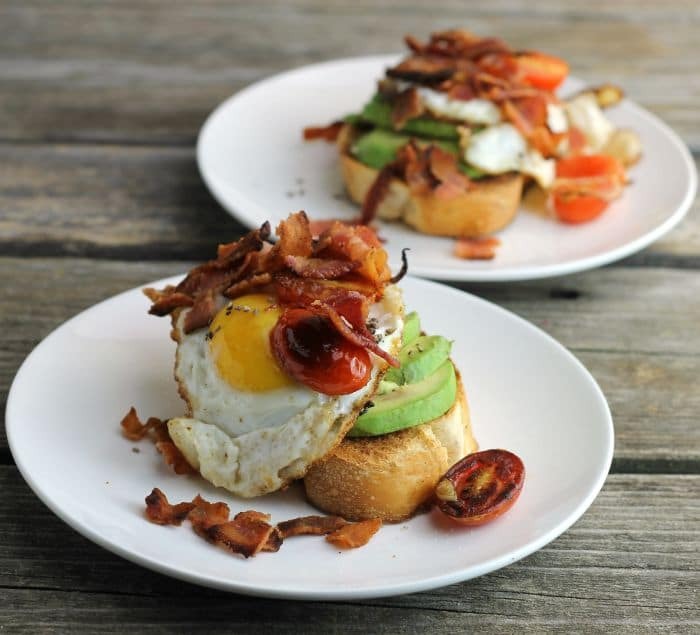 Avocado toast breakfast is super simple to make and a delicious savory breakfast that will be on the table before you know it. I know that I have said this so many times on this blog, but I am going to say it one more time. Breakfast is my favorite meal of the day. Yep, it is. And you know what else? 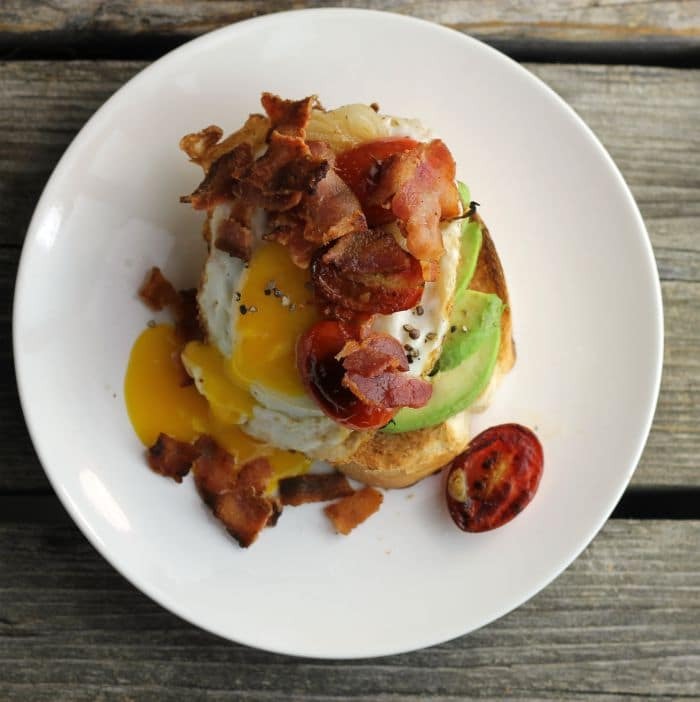 This isn’t the last time I will say that breakfast is my favorite meal on this blog. Mike and I started eating avocado only a few years ago. Somewhere we had a taste of guacamole and we have been hooked on avocados ever since. Then a couple of weeks ago my daughter told me about an avocado toast she had at a bed and breakfast where she and her husband were staying at. It has been stuck in my head ever since. I love the flavors that are in this avocado toast. The bacon, egg, tomatoes, and onion just go so well together. The eggs are fried in the bacon grease, which I love. As a kid, my mom would fry eggs in the bacon grease after preparing the bacon. I have never outgrown my love for the flavor. The onion and tomatoes are tossed in the bacon grease for a minute or two for the flavor and to heat them through. Simple things, but it makes for a wonderful breakfast or brunch. I hope you will try it. Did you know that the avocado is the only fruit that has heart-healthy monounsaturated fat – good fat. Slice the avocado into thin slices and set aside. In a skillet fry the bacon until crispy. Remove from the skillet and crumble into small pieces. Leave the bacon grease in the skillet. Cut the grape tomatoes in half and slice three thin slices of onion. Fry the eggs in the bacon grease. Remove the eggs and toss in the grape tomatoes and onion, fry for a minute or two until heated through and a little charred. To assemble: Toast the bread until golden brown. Top the toast with the avocado slices. 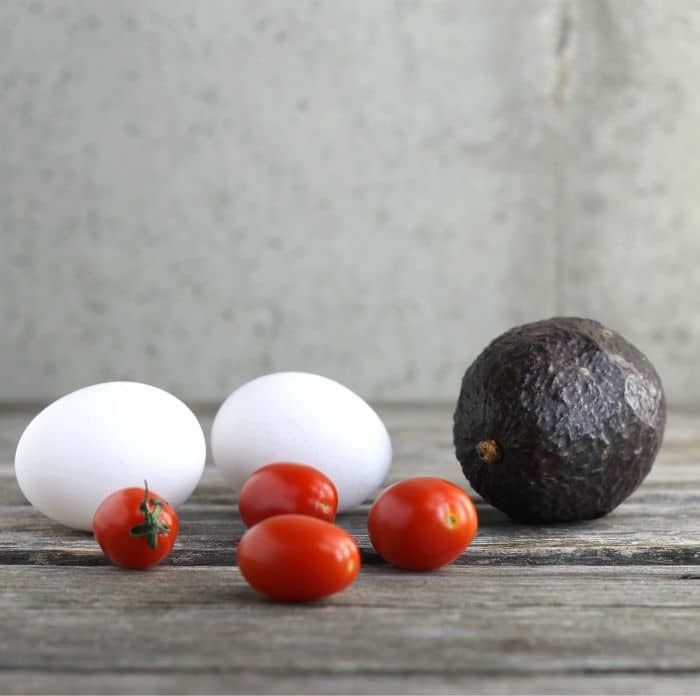 Place the eggs on top of the avocado. Season with salt and pepper. Top the egg with the tomatoes, onion, and bacon. Now that’s a breakfast! Bacon and avocado are my favourites. 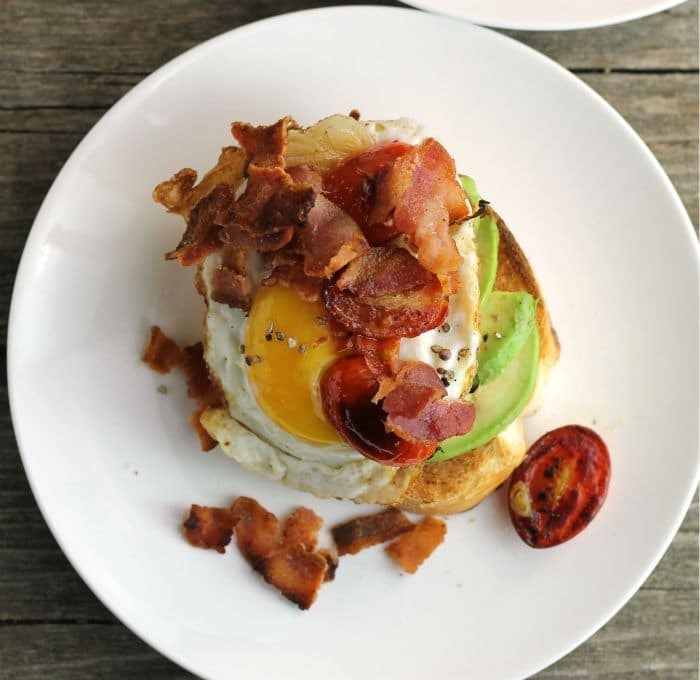 I love a good avocado toast…as long as it’s got bacon, too! This looks like my definition of the perfect weekend breakfast right here. Use a good grainy bread, and I’m in heaven! Looks delicious, Dawn! Looks like a great breakfast! Bacon on about anything works for me! Thanks, Dawn! This looks scrumptious! Wonderful looking breakfast. Or lunch. Or dinner. 🙂 Thanks!